Now is the perfect time to invest in your new kitchen with our New Year sale. Discover our award-winning approach and learn how we can help you to create a design that is truly unique to your home. Commission your design by 28th February 2019 to enjoy substantial savings on your new kitchen. To arrange your complimentary design consultation with a designer, book an appointment today. Our handmade kitchens are crafted in England to suit your style. We specialise in tailoring traditional cabinetry with contemporary, classic or industrial elements to bring a unique twist to each design. Modern kitchens designed to complement your interior and the architecture of your property. Our kitchens are thoughtfully crafted to your exact preference from exquisite materials and finishes such as hand died timber veneers and liquid metals. Watch our case study film to experience the journey of an Extreme kitchen from initial concept to completion. 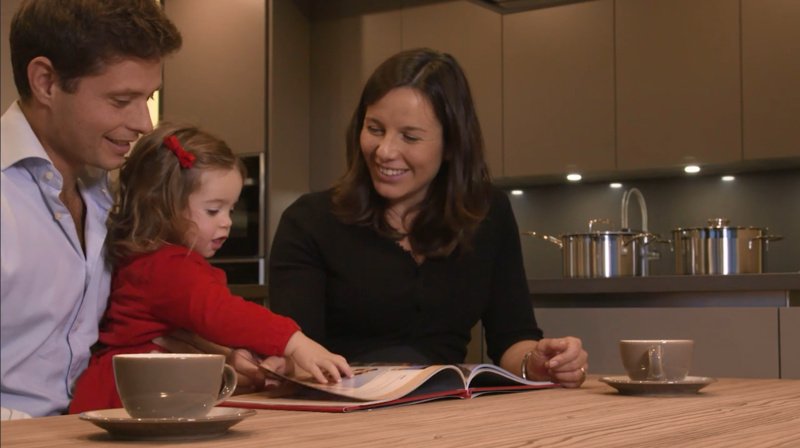 Maria and Aldo share their experience with Extreme and reveal how their shared adventure is captured in their personal kitchen design for their new family home. Since 1993, Extreme has helped people to create individual, personal homes through a design experience that is centred entirely around you. Experts in designing kitchens and furniture for all rooms within the home including bedrooms, studies and bars, Extreme’s service can be tailored to your exact requirements. Your design evolves through our collaborative design journey including bespoke mood boards, hand sketches and colour visuals – it’s why no two kitchens are the same. Request a complimentary appointment with a talented designer and begin your design journey. Request a copy of our portfolio for luxury kitchens and fitted furniture such as bedrooms, studies and bars. "WE COULDN'T RECOMMEND THEM HIGHLY ENOUGH"
"We spoke to a number of kitchen designers and Extreme were the only ones who thought past the architect's plans and came up with design ideas to optimise the space available both in practical and aesthetic terms. Extreme produced a detailed and very competitive quote, enabling us to see exactly where money was being spent and make tweaks to ensure the kitchen and utility room came in on budget. From the initial design phase, through to the project management, installation and after-care, Extreme have been brilliant and a real pleasure to work with. We couldn't recommend them highly enough." "Superlative design, service led culture and excellent after service." "THEY ADDRESSED ALL OUR BUG BEARS"
"We were delighted at the first meeting and were very inspired by their grip on what we wanted to achieve and what they could offer. After the first meeting we decided to add fitted wardrobes, a fitted study, cinema room and wine study to the project. The quotes were very informative and we knew exactly what we were getting, there was no need for any extras or changes. They addressed all of our bug bears we didn't want such as joints in worktops, wasted space above cupboards, and added some great ideas to maximise the impact."